WHAT'S WRONG WITH THE BATTERY? When a man does not feel well, he visits a doctor. When he has trouble on his car, he takes the car to a service station. What connection is there between these two cases? None whatever, you may say. And yet in each instance the man is seeking service. The term "Service Station" generally suggests a place where automobile troubles are taken care of. That does not mean, however, that the term may not be used in other lines of business. The doctor's office is just as much a "Service Station" as the automobile repair shop. The one is a "Health Service Station" and the other is an "Automobile Service Station." The business of each is to eliminate trouble. The battery repairman may think that he cannot learn anything from a doctor which will be of any use to his battery business, but, as a matter of fact, the battery man can learn much that is valuable from the doctor's methods of handling trouble. The doctor greets a patient courteously and always waits for him to tell what his symptoms are. He then examines the patient, asking questions based on what the patient tells him, to bring out certain points which will help in making an accurate diagnosis. Very often such questioning will enable the doctor to determine just what the nature of the illness is. But he does not then proceed to write out a prescription without making an examination. If he did, the whole case might just as well have been handled over the telephone. No competent physician will treat patients from a distance. Neither will he write out a prescription without making a physical examination of the patient. The questioning of the patient and the physical examination always go together, some questions being asked before an examination is made to give an approximate idea of what is wrong and some during the examination to aid the doctor in making an accurate diagnosis. The patient expects a doctor to listen to his description of the symptoms and to be guided by them in the subsequent examination, but not to arrive at a conclusion entirely by the description of the symptoms. A patient very often misinterprets his pains and aches, and tells the doctor that he has a certain ailment. Yet the doctor makes his examination and determines what the trouble is, and frequently find a condition which is entirely different from what the patient suspected. He then prescribes a treatment based on his own conclusions and not on what the patient believes to be wrong. Calling for Batteries. A doctor treats many patients in his office, but also makes his daily calls on others. Similarly, the battery repairman should have a service truck for use in calling for customers' batteries, especially where competition is keen. Some car owners cannot bring their cars to the repair shop during working hours, and yet if they knew that they could have their battery called for and have a rental battery installed, they would undoubtedly have their battery tested and repaired more frequently. In some instances a battery will be so badly run down that the car cannot be started, and the car is allowed to stand idle because the owner does not care to remove his battery, carry it to a service station and carry a rental battery with him. Batteries are heavy and generally dirty and wet with acid, and few people wish to run the risk of ruining their clothes by carrying the battery to a shop. The wise battery mail will not overlook the business possibilities offered by the call for and deliver service, especially when business is slow. A Ford roadster with a short express body will furnish this service, or an. ),- old chassis may be fitted up for it at a moderate cost. Of course, you must advertise this service. Do not wait for car owners to ask whether you will call for their batteries. Many of them may not think of telephoning for such service, and even if they do, they might call up some other service station. What does a man expect when he brings his battery to the battery service-station? Obviously lie expects to be greeted courteously and to be permitted to tell the symptoms of trouble which he has observed. He furthermore expects the repairman to examine and test the battery carefully before deciding what repairs are necessary and not to tell him that he needs new positives, new separators, or an entirely new battery without even looking at the battery. When a car is brought to your shop, you are the doctor. Sonic part of the mechanism is in trouble, and it is your duty to put yourself in charge of the situation. Listen to what the customer hp to say. He has certainly noticed that something is wrong, or he would not have come to you. Ask him what he has observed. He has been driving the car, starting the engine, and turning on the lights, and certainly has noticed whether everything. has been operating as it should. The things lie has noticed were caused by the trouble -which exists. He may not know what sort of trouble they indicate, but you, as the battery doctor can generally make a fairly accurate estimate of what the trouble is. You should, of course, do more than merely listen to -what the customer says. You can question him as to how the car has been used, just as the doctor, after listening- to what a patient has to say, asks questions to give him a clue to what has caused such symptoms. The purpose of the preliminary questioning and examination is not merely to make an accurate diagnosis of the troubles, but to establish a feeling of confidence on the part of the customer. A man who owns a car generally possesses an average amount of intelligence and likes to have it recognized and respected. Your questioning- and examination will either show the customer that you know your business and know what should be done, or it will convince him that you are merely putting up a bluff to hide your ignorance. What the customer wants to know is how much the, repairs will cost, and how soon lie may have his battery again. Estimate carefully what the work, will cost, and tell him. If a considerable amount of work is required and you cannot estimate how much time and material will be needed, tell the customer that you will let him know the approximate cost later, when you have gone far enough with the work to be able to make an estimate. If you find that the battery should be taken off, take it off without any loss of time and put on a rental battery. If there is something wrong outside of the battery, however, it will be necessary to eliminate the trouble before the car leaves the shop.otherwise the same battery trouble will occur again. If there is no actual trouble outside the battery, and if the driving conditions have been such that the battery is not charged sufficiently while on the car, no actual repairs are necessary on the electrical system. The customer should be advised to drive in about every two weeks to have his battery tested, and occasionally taken off and given a bench charge. It is better to do this than to increase the charging rate to a value -which might damage the generator or battery. Adopt a standard method of procedure in meeting, a customer and in determining what is wrong and what should be done. If the customer is one who brings his car in regularly to have the battery filled. and tested, you will: be able to detect any trouble as soon as it occurs, and will be able to eliminate it before the battery is seriously damaged. A change in the charging rate, cleaning of the generator commutator or cutout contact points, if done in time, will often keep everything in good shape. With a new customer who has had his battery for sometime, you must, however, ask questions and make tests to determine what is wrong. Before sending the customer away with a new, rental, or repaired battery, test the electrical system as described on page 276. The most important transaction and one which will save you considerable argument and trouble is to get everything down in black and white. Always try to have the customer wait while you test the battery. If you find it necessary to open the battery do this in his presence. When he leaves there should be no question as to what he shall have to pay for. If more time is required to determine the necessary work, do not actually do the work without getting in touch with the owner and making a written agreement as to what is to be done and how much the cost will be. The Service Record shown in Fig. 183 may be used- for this purpose. The following method of procedure is suggested as a standard. Follow it closely if possible, though in some cases, where the nature of the trouble is plainly evident, this will not be necessary any more than a doctor who sees blood streaming from a severe cut needs to question the patient to find out what is wrong. It may not always be necessary to ask all the questions which follow, or to ask them in the order given, but they cover points which the repairman should know in order to work intelligently. Some of the information called for in the questions may often be obtained without questioning the customer. Do not, however, hesitate to ask any and all questions covering points which you wish to know. 1. Greet the customer with a smile. Your manner and appearance are of great importance. Be polite and pleasant. Do not lose your temper, no matter how much cause the customer gives you to do so. A calm, courteous manner will generally cool the anger of an irate customer and make it possible to gain his confidence and good will. Do not argue with your customers, Your business is to get the job and do it in an agreeable manner. If you make mistakes admit it and your customer will come again. Keep your clothes neat and clean and have your face and hands clean. Remember that the first glimpse the customer has of the man who approaches him will influence him to a very considerable extent in giving you his business or going elsewhere. Do not have a customer wait around a long time before he receives any attention. If he grows impatient because nobody notices him when he comes in, it will be hard to gain his confidence, no matter how well you may afterwards do the work. Let the customer tell you his story. While listening, try to get an idea of what may be wrong. When he has given you all the information he can, question him so that you will be able to get a better idea of what is wrong. (a) How long have you had the battery? See page 242. (b) Was it a new battery when you bought it? (c) How often has water been added? (d) Has distilled water been used exclusively, or has faucet, well, or river water ever been used? Impure water may introduce substances which will damage or even ruin a battery. (e) Has too much water been added? If this is done, the electrolyte will flood the tops of the jars and may rot the upper parts of the wooden case. (f) How fast is car generally driven? The speed should average 15 M. P. H. or more to keep battery charged. (g) How long must engine be cranked before it starts? This should not require more than about 10 seconds. If customer is in doubt, start the engine to find out. If starting motor cranks engine at a fair speed, engine should start within 10 seconds. If starting motor cranks engine at a low speed, a longer cranking time may be required. The low cranking speed may be due to a run-down or defective battery, to trouble in the starting motor or starting circuit, or to a stiff engine. To determine if battery is at fault, see "Battery Tests," below. (h) Has the car been used regularly, or has it been standing idle for any length of time? An idle battery discharges itself and often becomes damaged. If car has been standing idle in cold weather, the battery has probably been frozen. (i) Has it been necessary to remove the battery occasionally for a bench charge? (j) Has battery ever been repaired? See page 322. 1. Remove the vent plugs and inspect electrolyte. If the electrolyte covers the plates and separators to a sufficient depth, measure the specific gravity of the electrolyte. If the electrolyte is below the tops of the plates and separators, see following section No. 2. If all cells read 1.150 or less, remove the battery and give it a bench charge. If the specific gravity readings of all cells are between 1.150 and 1.200, and if no serious troubles have been found up to this point, advise the owner to use his lights and starting motor as little as possible until the gravity rises to 1.280-1.300. If this is not satisfactory to him, remove the battery and give it a bench charge. (a) Water added to the cell or cells which have low gravity to replace electrolyte which had been spilled or lost in some other manner. (b) Electrolyte added to the cell or cells which have high gravity to replace the water which naturally evaporates from the electrolyte. (c) Trouble inside the cell or cells which have low gravity. The high rate discharge test will show whether there is any internal trouble. If any cell shows a gravity above 1.300, remove the battery, dump out all the electrolyte, fill battery with distilled water and put the battery on charge. If the gravity of one or more cells is 50 points less than the others, water has been used to replace electrolyte which has been spilled or lost in some other manner, or else one or more jars are cracked. A battery with one or more cracked jars usually has the bottom parts of its wooden case rotted by the electrolyte which leaks from the jar. If you are not certain whether the battery has one or more cracked jars, see that the electrolyte covers the plates in all the cells one-half inch or so, and then let the battery stand. If the electrolyte sinks below tile tops of the plates in one or more cells within twenty-four hours, those cells have leaky jars and the battery must be opened, and new jars put in. If the low gravity is not caused by leaky jars, give the battery a bench. charge and adjust the level of the electrolyte. 2. If you found electrolyte to be below tops of plates in all the cells, the battery has been neglected, or there mail be leaky jars. Add distilled water 'until the electrolyte covers the plates to a depth of about one-half inch. (a) If it requires only a small amount of water to bring up the level of the electrolyte, remove the battery and give it a bench charge. See page 198. Only a brief charge may be necessary. Ask the driver when water was added last. If more than (I month has passed since the last filling, the upper parts of the plates may be sulphated, and the battery should be charged at a low rate. (b) If it requires a considerable amount of water to bring up the level of the electrolyte, and the bottom of the wooden battery case shows no signs of being rotted, the battery has been neglected and has been dry for a long time, and the plates are mostly likely badly damaged. Open the battery for inspection. (c) If only one cell requires a considerable amount of water to bring up the level of its electrolyte, and the bottom of the wooden battery ease shows no sign of being rotted, that cell is probably "dead," due to in internal short-circuit. To test for "dead" cells, turn on the lamps and measure the voltage of each cell. A dead cell will not give any voltage on test, may give a reversed voltage reading, or at the most will give a very low voltage. A battery with a dead cell should be opened for inspection. (d) If the bottom part of the wooden battery case is rotted, and a considerable amount of water had to be added to any or all cells to bring up the level of the electrolyte, the battery has leaky jars and must be opened to have the leaky jars replaced by good ones. If there is any doubt in your mind as to whether any or all jars are leaking, fill the cells with distilled water and let the battery stand for twelve to twenty-four hours. If at or before the end of that time the electrolyte has, fallen below the tops of the plates in any or all cells, these cells have leaky Jars and the battery must be opened and the leaky jars replaced with good ones. The electrolyte which leaks out will -wet the bench or on which the battery is placed and this is another indication of a leaky jar. In addition to the tests which have been described, a general inspection as outlined below will often be a great help in deciding what must. be done. 1. Is battery loose? A battery which is not held down firmly may have broken jars, cracked sealing compound around posts or between posts and separators, and active material shaken out of the grids. There may also be corrosion at the terminals. 2. Are cables loose? This will cause battery to be in a run down condition and cause failure to crank engine. 3. Is there corrosion at the terminals? This will cause battery to be in a run-down condition and cause failure to start engine. Corrosion is caused by electrolyte attacking terminals. A coating of vaseline on the terminals prevents corrosion. 4. Is top of battery wet? This may be due to addition of too much water, overheating of battery, cracks around posts and between posts and cover, electrolyte thrown out of vents because of battery being loose, or electrolyte or water spilled on battery. Such a condition causes battery to run down. 5. Is top of case acid soaked? This is caused by leaks around posts or between covers and jars, flooding of electrolyte due to overheating or due to addition of too much water, or by electrolyte spilled on covers. 6. Is lower part of case acid soaked? This is caused by leaky jars. 7. Are ends of case bulged out? This may be due to battery having been frozen. This general inspection of the battery can be made in a few seconds, and often shows what the condition of the battery is. Turn on the lights. If they burn dim, battery is run down (and may be defective) and battery needs bench charge or repairs. If they burn bright battery is probably in a good condition. With the lights burning, have the customer or a helper step on the starting switch. If the lights now become very dim, the battery is run down (and may also be defective), or else the starting motor is drawing too much current from the battery. 1. Loose or dirty terminals or cell connectors. This may reduce charging rate, or open charging circuit entirely. Remedy: Tighten and clean connections. 2. Corrosion on terminals or cell connectors caused by acid on top of battery due to over-filling, flooding, defective sealing, lead scraped from lead-coated terminals, and copper wires attached directly to battery. A badly corroded battery terminal may cause the generator, ignition coil, and lamps to burn out because of the high resistance which the corroded terminal causes in the charging line. It may reduce charging rate, or open charging circuit entirely. Remedy: Remove cause of corrosion. Clean corroded parts and give coating of vaseline. 3. Broken terminals or cell connectors. These may reduce charging rate or open charging circuit entirely. Remedy: Install new parts. 4. Generator not charging. Remedy: Find and remove cause of generator not charging (see page 284). 6. Acid or moisture on top of battery due to defective sealing, flooding, spilling electrolyte in taking gravity readings, loose vent plugs. This causes corrosion and current leakage. Remedy: Find and remove cause. 7. Tools or wires on battery causing short-circuits. Remedy: Tell customer to keep such things off the battery. 8. Short-circuits or grounds in wiring. Remedy: Repair wiring. 9. Cutout relay closing late, resulting in battery not being charged at ordinary driving speeds. Remedy: Check action of cutout. See page 282. 10. Excessive lighting current, due to too many or too large lamps. Remedy: Check by turning on all lamps while engine is running. Ammeter should show three to five amperes charge with lamps burning. In winter the charging rate may have to be increased. 1. Has water been added regularly? 2. Has impure water, such as faucet, well, or river water ever been added to battery? 3. Has too much water been added? 4. Has electrolyte been spilled and replaced by water? 5. Has battery been idle, or stored without regular charging? 6. Is car used more at night than in daytime? Considerable night driving may prevent battery from being fully charged. 7. Is starter used frequently? 8. What is average driving speed? Should be over 15 M. P. 11. 9. How long is engine usually cranked before starting-? Cranking period should not exceed 10 seconds. 1. Improperly treated separators used. 2. Grooved side of separators put against negatives instead of positives. 5. Positives used -which should have been discarded. 6. Bulged, swollen negatives used. 7. Poor joints due to improper lead-burning. 1. Acid or moisture on top of battery, due to defective sealing, flooding, spilling electrolyte, loose vent plugs. This causes current leakage. Remedy: Find and remove cause. 2. Tools or wires on battery, causing short-circuits. Remedy: Tell driver' to keep such things off the battery. 3. Electrolyte or acid added to cells giving the high gravity readings. 4. Electrolyte spilled and replaced by water in cells giving low readings. 5. Grooved side of separators placed against negatives in cells giving the low readings. 6. Separator left out, cracked separator used, hole worn through separator by buckle([ plate or swollen negatives, or separators in some cells and new ones in others. 7. Old plates used in some cells and new ones in others. 8. Impurities in cells showing low gravity. 9. Shorted cell, due to plates cutting through separators. 11. Oil some of the, older cars a three wire lighting system was used. If the lights are arranged so that more are connected between one of the outside wires and the center, than between the other outside wire and the center, the cells carrying the heavier lighting load will show low gravity. 12. On some of the older cars, the battery is made of two or more sections which are connected in series for starting and in parallel for charging. Oil such cars the cells in one of the sections may show lower gravity than other cells due to longer connecting cables, poor connections, corroded terminals, and so on. Such a condition AN-ill often be found in the old two section Maxwell batteries used previous to 1918. This is a condition in which the hydrometer readings would indicate that a battery is almost or fully- charged, but the battery may fail to operate the starting motor. If the lights are burning while the starting switch is closed, they -will become very dim. The gravity readings may be found to be above 1.300. 1. Electrolyte or concentrated acid added instead of water. 2. One of the numerous "dope" solutions which have been advertised extensively within the past two years. Never use them. If customer admits having used such a "dope" warn him not to do so again. 2. Electrolyte replaced in wrong cell after taking gravity readings. 4. Battery overcharged, causing loss of water by overheating and excessive gassing. 2. Carbonized, dry, cracked separators. 1. Water not added regularly. 4. Battery on hot place on car. 5. Alcohol or other anti-freeze preparation added. 8. Battery over-charged by long daylight runs. 1. Too much water added. 2. Battery loose in box. 3. Cracks in sealing compound due to poor sealing, or cables pulling on terminals, or due to poor quality of sealing compound, or good quality compound which has been burned. 1. Upper portion of case rotted by acid. 4. Upper parts of separators dry. 1. When May a Battery Be Left on the Car? (a) When you find that the specific gravity of all cells is more than 1.150, the voltage of each cell is at least 2, the voltage doe's not drop when the lights are turned on, or the lights do not become very dim -when the engine is cranked with the starting motor, there are no loose terminals or connectors, the sealing compound is not broken or cracked so as to cause a "slopper," the electrolyte covers the plates, the box is not rotted by acid, and there are no broken jars. These conditions will exist only if battery has been well taken care of, and some trouble has suddenly and recently arisen, such as caused by a break in one of the battery cables, loosening of a cable connection at the battery or in the line to the starting motor. 2. When Should a Battery Be Removed From Car? (a) When you find broken sealing compound, causing the battery to be a "slopper." (b) When you find inter-cell connectors and terminals loose, corroded, or poorly burned on. 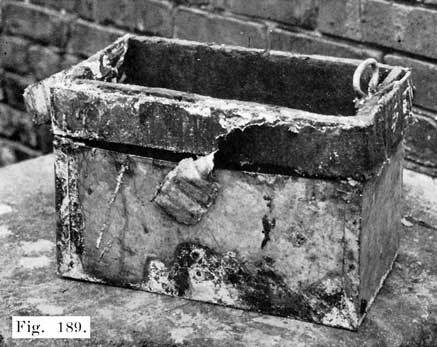 (c) When you find box badly rotted by acid, or otherwise defective. (d) When you find a cracked jar, indicated by lower part of case being acid soaked, or by low electrolyte, or find that electrolyte level falls below the tops of the plates soon after adding water. (e) When you find a dead cell, indicated by very low or no voltage, even on open circuit. (f) When specific gravity of electrolyte is less than 1.150, or gravity readings of cells vary considerably. (g) When battery voltage drops to about 1.7 or less per cell when lamps are turned on, or lamps become very dim when the starting motor is cranking the engine, or the high rate discharge test shows that there is trouble in the cells. (h) When you find that electrolyte is below tops of plates, and it requires considerable water to bring it up to the correct height. (i) When battery overheats on charge, or discharge, although battery is not located in hot place, charging rate is not too high and lamps and accessories load is normal. (k) When a blacksmith, tinsmith or plumber has tried his hand at rebuilding the battery. Such a battery is shown in Fig. 189. (1) When ends of care are bulged out. 3. When Is It Unnecessary to Open a Battery? (a) When the only trouble is broken sealing compound. The battery should be resealed. (b) When loose, corroded, or poorly burned on terminals and connectors have merely resulted in keeping battery only partly charged and no internal troubles exist. The remedy is to drill off the connectors, or terminals, and re-burn them. (c) When the external condition of battery is good, and a bench charge, see page 198 (with several charge and discharge cycles if necessary) puts battery in a good condition, as indicated by voltage, cadmium, and 20 minute high rate discharge test. 4. When Must a Battery Be Opened? (a) When prolonged charging (72 hours or more) will not cause gravity or voltage to rise. Such trouble is due to defective plates and separators. (b) When battery case is badly acid soaked. A slightly acid soaked case need not be discarded, but if the damage caused by the acid has been excessive, a new case is needed. Plates may also be damaged. (c) When one or more jars are cracked. New jars -are needed. The plates may also be damaged. (d) When one or more cells are "dead," as indicated by little or no voltage, even on open circuit. New plates (positives at least) may be required. (e) When battery is more than a year old and action is unsatisfactory. (Battery will not hold its charge.) Battery may have to be junked, or new separators may be required. Every battery should be reinsulated at least once during its lifetime. (f) When a blacksmith, tinsmith, or plumber have tried to repair a case, Fig. 189. Fig. 189. A Blacksmith and Tinsmith Tried Their Hands on This Case, Lower Part Enclosed in Tin, Strap Iron, Covered with Friction Tape, Around The Top. (g) When the ends of case are bulged. A new case is needed. If the battery has been frozen it should generally be junked. There are some cases on record of a frozen battery having been thawed out and put in serviceable condition by a long charge at a low rate followed by several cycles of discharge and recharge. Generally, at least, a new case, jars, and positives are required. NOTE: New separators should always be installed, whenever a battery is opened for repairs, unless the separators already in the battery are new, and the trouble for which the battery was opened consists of a leaky jar, a separator left out, or some other trouble which does not require pulling the plates out of mesh.